Take your cleaning further with the Neato Botvac D7 connected Robot Vacuum. With lasers mapping and Navigation it covers more area in less time, moving around your house logically—not randomly. New zone cleaning lets you pinpoint trouble areas you want to clean more frequently. Turbo mode provides an extra powerful clean picking up debris you can't see, while the robotic D-Shape design tracks down dirt in corners and along walls better than others. The BotVac D7 Robot Vacuum is super smart, remembering multiple floor plans and letting you create no-go lines on each, so your Robot knows where not to go. And it keeps getting smarter, so you’re first to have the latest features. With up to two hours of battery life, the BotVac D7 Robotic Vacuum is perfect for even the largest homes. WARNING: This product can expose you to chemicals including Cadmium, which is/are known to the State of California to cause cancer and birth defects or other reproductive harm. For more information go to www.P65Warnings.ca.gov. Amazing - A True Game Changer! I absolutely love our new Neato D7... I had no idea I needed this, but don't know how we could go without one now. Having kids and 3 dogs, it is such a joy (and fun to watch), how great of a job this little thing does cleaning our floors. It does a great job with how well it cleans and you would never know I have 3 dogs! So easy to empty out and love the floor plan edits you can do. I often put it in other rooms as well upstairs and does a great job. I'm so impressed with this product and love that when it's done, it takes itself back to the charger base to charge all by itself! Easily the best $800 I have spent in the past 12 months. Highly Recommended! Everything we could ever ask for! We are so in love with our Neato robot vac! This is the first vacuum that doesn't bother our dog and it keeps up with all his hair—he's a German Shepherd so there is a lot of it. It is quiet and the app is so user friendly. We have it set to run every night at midnight: 5 nights on eco mode and 2 nights on turbo mode. It is the best feeling to wake up to a clean floor every morning and it is quiet enough that we don't hear it run while we sleep. Our floors are linoleum, carpet, and a very shaggy throw rug and it doesn't have any issues transitioning over any of those areas. I would highly recommend this to anyone and everyone, we love ours!! It was a life changing purchase. I received this as a gift for Christmas! I absolutely LOVE this machine! We have older carpet that just always looks dirty and I don't have time to vacuum everyday. So with this botvac I am able to vacuum everyday and it makes my world a better place! It does a great job for a robot vacuum and makes my weekly cleaning much easier and faster! I love that it has the app and I can schedule cleanings or just run the vacuum anytime I need to! I use the app all the time! I love that it goes in a pattern and not just random, I feel like my home is much cleaner with that feature! Do yourself a favor and get this machine! You will love it! I bought this Vacuum about a month ago and have enjoyed using it. I have found it does a very good job of cleaning the entire house in about 1.5 full charges, but is this Neato a little pricey for the difference in features from the Neato D3 or D4? 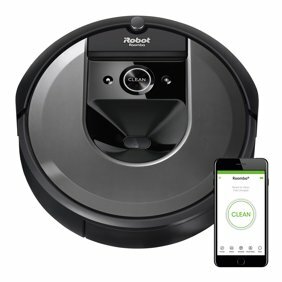 When upgrading an iRobot vacuum, the enhanced features seem to go up in value, for example the features between the Roomba 690 and Roomba i7+ 7550 are very distinct. The main differences between the D3 (lowest model) and the D7 (highest model) are the battery life, side brush, eco/turbo mode, and manual option for cleaning. Are these enhancements really worth the 400-500 dollar markup and this is coming from someone who owns the D7. Bought my new D7 3 weeks ago. The vacuum cleans well and has only became stuck twice. Maintain the vacuum is straight forward, its easy to clean. Connectivity with phone app is efficient. Biggest disappointment is the ability to use the my floor plan feature. My home is 3000 soft and the vacuum is still trying to complete a floor plan run. Any interruption causes the floor plan not to complete and the features like "no go zones" are not available even if the floor plan is 90% complete. I am having to manually wall off areas of my home to control where it goes. The software should allow flexibility to create no-go zones with any floor plan mapped. Great concept, execution could use some work. I've had my D7 for a few months now. The unit itself is fantastic, picks up dirt and pet hair great. However the app needs some work. You can only set one house map with no go lines, which is annoying when I want to use it upstairs. It also only notifies me that it's full at the start of a cleaning. When on a schedule it just doesn't vacuum till you empty it. Waste of a day if I forget. Id recommend the cheaper units over this one until the app is fully featured. I purchased the D7 in March and just last week it stopped working (the laser just wouldn't work) mid cleaning. Luckily I have an older Neato that has been demoted to the basement so we can still get the daily vacuum. But I will say I run the D7 everyday on turbo mode and while it is louder it picks up all the hair and everyday mess that goes on in a home with 5 kids and a dog. I love the no-go lines and honestly if it weren't for it crapping out mid cleaning I would easily give it a 5 star but for receiving it 3/28/18 it's a little soon to be having issues. They were great about getting it in to get it fixed and I can't wait to have it back. While I am satisfied with the cleaning, there is a major design flaw in the robot causing scratches in my hardwood floor. The brush housing is so low that it touches and drags on the floor while cleaning. After three short cleaning attempts, the brush housing has already worn out to the extent that the circular portion is flat now because of extensive dragging on the floor. Plus this robot vaccum is very loud. The good aspect of this vaccum is the floor mapping and zone cleaning which works well. Unfortunately, I will need to return the product and will not recommend it to anyone. What does Rollback item mean?